Home » A Tungusian, Evenki in his ordinary Dress. Un Toungouse en Habit ordinaire. INCESSANTLY changing their place of abode, the habitations of the Evenki are as moveable as themselves. They consist of several poles driven into the ground, and covered over with matting, made of birch-tree bark, and very much resembling the coarsest cloth. At the top of this tent an aperture is left for the purpose of letting out the smoke. When they wish to go out or in, they lift up a small door, made of the same materials. When they remove their dwelling, the poles (unless they chance to be in deserts unfurnished with wood) are thrown away, the matting is carefully rolled up, and a new habitation is constructed in the first place where they are desirous of taking up their abode. Men and women dress exactly alike. A skin garment is worn next the body, which descends no farther than the knees. Their breeches, which are short, and made in winter of fur, and in summer of the skins of fishes, are fastened by a lace to the girdle. Their fur boots are decorated with glass beads, or striped of different colours. They wear a sort of small apron, of brown or yellow leather, and trimmed at the edge with fringe. Their outer garment is laced in the front, but as it is too narrow to meet, the bosom is covered with a breast-piece, embroidered with glass beads, or horse-hair of various colours. Over this stomacher the most superstitious among them wear an idol, cut out of a plate of iron, representing the figure of a man, a bird, or a quadruped. They imagine themselves under the protection of this idol, and hope thereby to obtain a successful chase, or an abundance of fish. The greater part have lines or figures traced upon the forehead, the cheek, or the chin. This is done by the father, when the children are from six to ten years of age. To perform this painful operation, they make use of thread blackened with the soot of their cauldrons: by the aid of a needle, the thread is passed under the skin of the unfortunate sufferer, and the blue spots occasioned by this process remain on the countenance for the remainder of his life. The Evenki eat a great quantity of berries, herbs, and roots. They devour every species of quadrupeds, even rats and carrion. The use of strong liquors is unknown to them; their only beverage is water, or broths. Both men and women are accustomed from their infancy to smoke tobacco. The Evenki support hunger with great patience, and are little affected by long fasting; but, in seasons of plenty, they eat to an excess. They have no regular hours of repast, and are governed, in this respect, entirely by hunger, opportunity, and caprice. Formerly known as Tungus or Tunguz, Mongolian. Tungusic people of Northern Asia. The Evenks are recognized as one of the Indigenous peoples of the Russian North. The traditional religion of the Evenki is strongly influenced by shamanism. The Evenki shamanism was in research even as a classic, typical form. The term “Shaman / chaman / saman” comes from the Evenki. 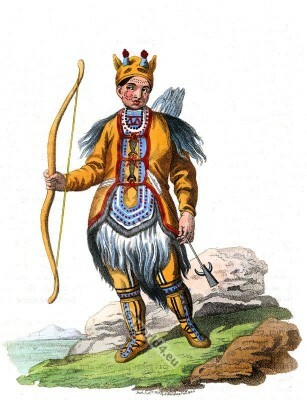 This entry was posted in 1803, 19th Century, Asia, Russia, Traditional and tagged Edward Harding, Russian national costumes, Tattoo on 11/7/14 by world4.